My 02 Firebird 3.8L is overheating. I have flushed the motor, had the radiator rodded out, new water pump, 195 thermostat, cap and cleaned the hoses and new coolant. Everything had a reddish sticky film on it. I assumed this was due to the coolent not ever being changed. We have had the car for about 15 months. I changed all this yesterday. Drove the car around the block a few times, had no problem. My daughter drove the car last night and it overheated. They had to add water. I checked it and also added water. When I bled the air out of the system, nothing but steam came out for about 5 min. Then added more water, then more steam. Its like the water is turning to steam in the block before it has a chance to circulate. I cant figure it out. There is no water in the oil. Also was thinking of checking the compression. 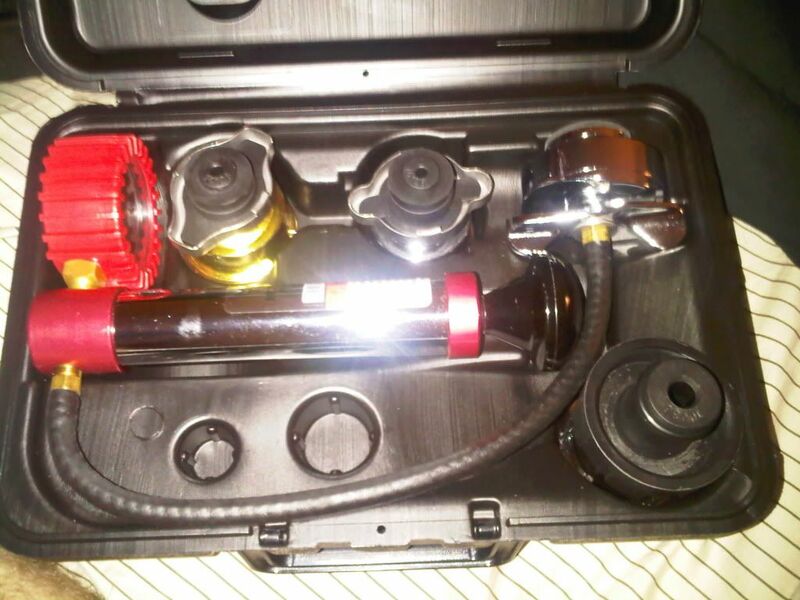 I checked the compression, cylinder 1-150psi, 3-150psi, 5-150psi, 2-150psi, 4-122psi, 6-100psi. I haven't seen any leaks. I was able to secure a funnel about 3 inches above the radiator cap to see if the coolant would still come out, but the coolant still shot out of that and steam still came out of the bleeder valve. I then added over a gallon of water again and again. I use to have a Gran Prix with about the same setup, never had this kind of problem. Could the head gasket be leaking causing the coolant to leak into the cylinder causing it to overheat? Or could some of the water jackets be plugged? You could still have a blown head gasket. You need to pressure test the cooling system to see if it will hold pressure for about an hour. Thats a good idea. So fill everything up and run the car to operating temperature. Then cut the car off and keep an eye on the pressure? Fill the system, install a pressure tester to the radiator cap and pump it up to about 16PSI and watch the gauge and inspect the car carefully for any drips.. Most auto parts stores will rent/loan out the tool. Ok, I rented a tester and found the leak. The plastic elbow thats just under the intake and attaches to the crossover was leaking. When I took this piece out, both ends were broke off. So I replaced both of them and refilled the radiator. I put the tester on again and pumped it up to 15psi. It dropped 3lbs in 40 minutes. I then put the cap back on and started the car. Had some white smoke to start, then none. The motor warmed up, I then proceeded to bleed the air off. Did not have any steam this time. I'm a little concerned with the compression in cylinders 4(122psi) and 6(100psi). Could this be the cause of the pressure drop and white smoke? But anyway, So far so good. I will know for sure tomorrow when the car is driven in town. Good call on the tester and thanks for the help. You could have gotten it a little too hot and blown a head gasket. See if you have any more overheating problems.